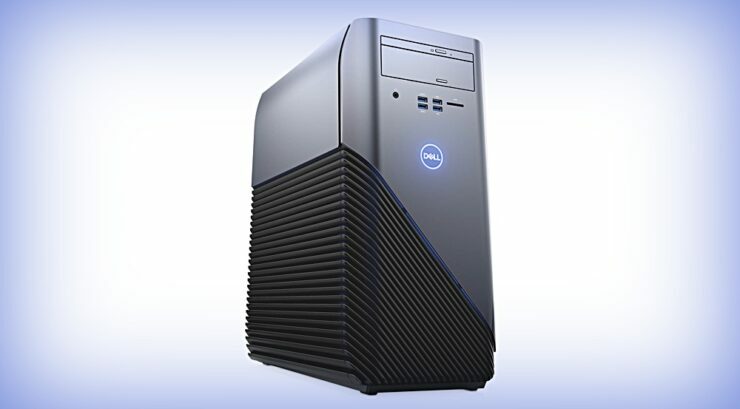 Dell has announced a new Inspiron Gaming Desktop that is outfitted with AMD and AMD Ryzen processors. Not only it’s cheap, but it packs a good amount of punch for those on a budget. If you are looking to jump into the world of gaming, but don’t have a lot of cash to spare on all the bells and whistles, then Dell’s new Inspiron Gaming Desktop is something you should look into. Not only it’s affordable but packs a decent amount of hardware under the hood to get you started as well. Unlike a usual gaming PC, this new one from Dell offers nothing fancy in the case design department. This is a good (or bad) thing, depending on how you look at it. It does not go overboard, that’s for sure. But rest assured that you will get perfect ventilation when the need arises. You get a standard array of ports with the desktop. This includes a couple of USB 2 and USB 3.1 ports at the front, along with an audio jack and card reader. At the back you get a coupe of more USB 2 ports, USB 3.1 ports, HDMI and one port each for connecting your keyboard and mic. On the processor front, you can configure the desktop with either an AMD or AMD Ryzen. You can either go for the seventh-generation AMD processor (A10 or A12) with Radeon R7 graphics. Whereas the AMD Ryzen option includes the Ryzen 5 1400, 1600X and the Ryzen 7 1700X chips. Basically, you have the total option to make this desktop as powerful as you like. Taking things further, you can customize the desktop with up to 32GB of DDR4 memory. There’s an option to equip your rig with a 2TB hard drive or a 256GB SSD alongside a 2TB drive. Depending on your use case, that’s a combo you can play around with before reaching a final decision. There are also extra storage bays available to those who wish to expand hardware at a later date. On the graphics front, you have the option to throw in something discrete from AMD or NVIDIA both. This goes as high as an RX 580 with 8GB of memory or a GeForce GTX 1060 with 6GB of memory. Choose your poison carefully here. Personally, if you are looking to go ahead with some insane gaming on a budget, then I would suggest opting for discrete graphics at any given day. Starting at just $599, the Inspiron Gaming Desktop starts off pretty cheap. But of course, as soon as you start to spec things up, the price is bound to shoot up considerable. Hence, make sure you keep things as sane as possible if you need the perfect balance between price and performance.